Hydraulic fracturing, also known as “hydrofracking” or just simply Fracking, is a process that uses special drilling and extraction techniques to access the natural gas deposits found deep beneath the Earth’s crust in low permeable geological bedrock formations and in particularly those formed by hard shale rock. Today, we consume vast amounts of energy and humans have long looked at the rocks and minerals beneath the Earth for new sources of energy, power and wealth. Millions of years ago dense swampy tropical rain forests covered the Earth and over time the trees and lush vegetation within these forests died which has left thick layers of coal, oil and gas deposits stretching across the planet deep below the surface. The burning of gas instead of coal or oil has long been desirable with regards to lower emissions of greenhouse gases and many other airborne pollutants as natural gas is a cleaner burning fuel with a lower carbon footprint compared to the burning of other fossil fuels. Conventional oil and gas exploration and production involves drilling bore holes deep down into the porous and permeable rocks allowing it to be extracted. However, there is another type of gas deposit called “Shale Gas” formed by microbes and biological activity which is naturally trapped within very fine sedimentary shale rock formations that are porous but impermeable located at depths of over 2 miles below the surface. Shale gas is another carbon based natural gas and no different than what you currently use to heat your home or cook your food, or use to generate electricity as it is chemically the same as natural gas, being mainly methane. On its own, shale gas is a type of gas that appears cheap and plentiful. But this shale gas was not economically feasible to extract before the advent of horizontal drilling and hydraulic fracturing (fracking) techniques as the drilling on its own does not release the gas which is trapped within the rocks. Similarly to conventional gas, shale gas extraction is via a bore hole and well. A bore hole is drilled vertically down to just above the shale stream, then the drilling process does something clever making it different from conventional drilling. The drill bit is steered or bent around 90 degrees until it is horizontal and then the drilling continues. This horizontal drilling is because the reservoirs of shale gas are wider than they are tall, so horizontal drilling accesses more of the shale gas reserves. To allow the gas to flow, fractures have to be created in the rock. This is done by hydraulic fracturing which uses millions of gallons of water and various chemicals to keep the process lubricated. The injection of this chemically treated water and sand, called the “fracturing fluid”, injected under high pressure opens up naturally occurring fractures within the bedrock creating new cracks and enlarging fissures (increasing permeability) allowing the natural gas which was locked inside the solid rock for millions of years to leak out and to flow into the well so that it can be harvested for energy use at the surface. Fracking produces energy from shale and has allowed many wells and drilling rigs to become more economically viable as the fracking shale gas process has proven to be a means of increasing the wells output production as more gas can be extracted from a given area of land. After fracking, the injected water from the shale is brought back up to the surface for treatment and recycling as the water contains a cocktail of chemicals and additive’s used in the fracking shale gas process as well as contaminants from the shale formation. How much of the water that was pumped down the well as part of the hydraulic fracturing process comes back up to the surface, called “waste water” depends on local geography and effectiveness of the fracking process but can be as much as 80%. This means then that over 20% of the chemically treated water and sand mixture remains underground and once underground, this fracking liquid mixes with the naturally occurring waters causing possible contamination of surface and drinking water wells as well as being subjected to geological forces and chemical processes over the long term, from years to decades. Also, fracking shale gas produces waste and this waste water may contain naturally occurring radioactive substances from deep underground. The biggest disadvantages of fracking shale gas is that hydraulic fracking is a very water intensive activity, hence the name “hydrofracking”, using a fracking fluid of approximately 90% water and a 10% mixture of sand and chemical additives. The same well area, known as a well pad, can be fracked many times over in different directions using millions and millions of litres of water per day in the process. Many people are unhappy that hydraulic fracturing uses too much of our most precious natural resource, (water) to mine for a gas that is far less valuable. But the volume of water consumed by each fracking process will vary depending on its location and rock geology and the recycling and reusing of this waste water will help cut down on the clean water consumed by fracking. We have seen in simple terms that hydraulic fracturing involves injecting a fracturing fluid (a mixture of water, sand and chemicals) at high pressures into a bore-well that penetrates deep below the Earth’s surface to crack the rock and access the shale gas. Fracking shale gas uses a new horizontal drilling process that wasn’t available until just recently due to advances in sonar scanning and drilling technology. 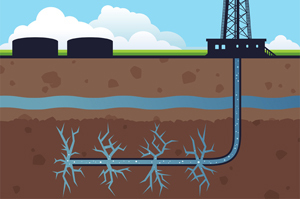 By using a pressurised water-filled pipe the fracking process creates fractures and fissures deep below the ground’s surface. These fissures cause the ground to crack, releasing natural gas and oil to flow more feely from the underground formations into a well that can then be harvested for energy use. Fracking shale gas has unlocked a new source of power from the planet by allowing natural gas deposits trapped deep in the Earth which would not be feasible to recover in any other way to be released and captured for use in our homes, businesses, and as an alternative fuel for some cars. But fracking shale gas is a high risk activity that can potentially impact on human health and have wider environmental issues. Renewable energy alternatives, energy savings and a significant reduction in CO2 emissions are the only viable path to an environmentally sustainable future. There are many potential risks associated with fracking shale gas with the biggest being the potential environmental contamination from the toxic chemicals used in the fracking process, methane contamination of local water supplies as the gas leaks out of the wells into the surrounding land, radioactive compounds and contaminated waste water disposal. Also fracking has the potential to cause increased seismic activity and even earthquakes by lubricating geological faults with the chemical additives used in the fracking shale gas process. By exploiting unconventional fossil fuels such as shale gas and coal bed methane deposits by fracking, the world’s dependency on fossil fuels will continue on and as such will slow down the large scale development and deployment of more cleaner and greener renewable energy sources. For more information about “Fracking” and how hydraulic fracturing can be used to extract natural gas from shale deposits deep below the Earth, or to explore the advantages and disadvantages of fracking on the environment, then Click Here and order your copy about fracking from Amazon today and learn more about hydraulic fracturing (fracking) and its procedures, issues, and benefits. Very well versed written article. It would be my pleasure to share a fact belongs to the topic & it will blow the mind of oil and gas professionals that Torpedoes were used earlier in oil wells to increase the well flow laying the roots of “Fracturing”. Find the detailed info on Oges, a global oil and gas portal. Copyright © 2010 − 2019 All Rights Reserved.